Pannill's Gate Farm | Would You Be Mine? Could You Be Mine? The age old way of selecting a bull is to use you neighbor’s bull. This was how it was done for thousands of years, and it still has some merit. In fact, this is how landraces and breeds were developed. Historically, where we lived and who our friends were influenced the bulls we used, and consequently what our cattle looked like. We’re fortunate enough to have great neighbors who have some pretty decent bulls. That’s how we got our cows bred when we first started out. It makes a lot of sense when you only have a few cows. It also makes sense from the neighbors perspective. The last thing they need is a bull that keeps getting out to go visit some open (unbred) cows. Make your bull decisions early and definitively. 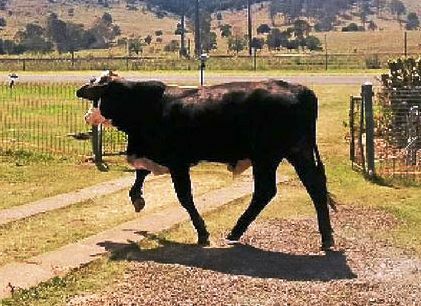 The last thing a cow owner needs is something like this paying the cows a visit. Make your bull selection before someone does it for you.